While the traditional uses of drones are typically commercial or recreational, one UK-based company is using them to help the environment. BioCarbon Engineering has teamed up with drone manufacturer Parrot to create a system for autonomously planting trees to fight deforestation. According to the World Economic Forum, the world cuts down roughly 15 billion trees but only plants 9 billion. This is in part because replanting manually is very slow and expensive. The drone-based system on the other hand is able to plant trees ten times faster than humans, for 85% less money, and in places humans can't reach. The drones are organized in fleets of 6 drones each. Each fleet will first use GPS and computer vision techniques to create a 3D map of the terrain to be reforested. 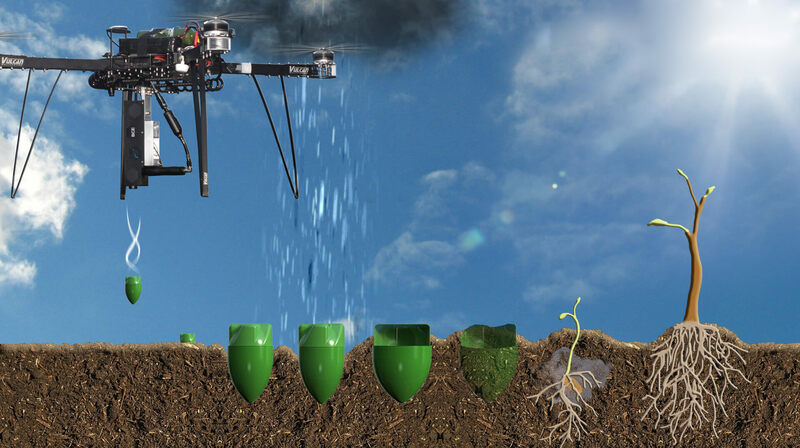 The drones will then come back and shoot germinated seed pods in pre-defined areas of the terrain. They can fire the seeds at roughly one every second for a total of 100,000 each day. The drones can also carry different seed types to help create a more diverse ecosystem. The company released an overview of how the system would work a few years ago, but it has now been implemented and is beginning to restore mangroves in Myanmar. BioCarben Engineering plans to operate 150 fleets of drones and has a goal of planting half a trillion trees in the next three decades.